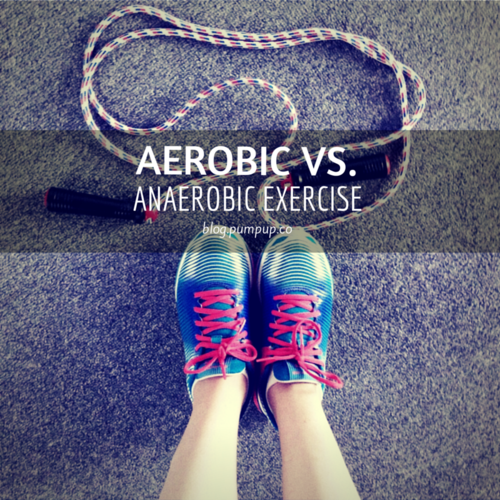 Anaerobic vs. Aerobic Activities: Which is Best for Your Overall Health? Article by Andrea Wilkins, freelance writer. Follow PumpUp on Tumblr for more fitness tips! If you’re looking to adopt a fitness regimen – whether for weight loss, increased endurance for an upcoming event or simply improving your quality of life through better health – you’ve no doubt come across a dizzying array of workout plans, all of them promising results. While fitness experts may squabble over weight machines versus free weights or duration versus intensity in a cardio workout, most would agree that variation in one’s workout is crucial to achieving full-body fitness, and there isn’t one single master fitness regimen that renders all others obsolete. After taking a close look at some of the most lauded regimens, however, you might start noticing some patterns. First of all, there’s that variation factor again: Most decent workouts engage a variety of muscle groups, and some may vary in intensity – that is, how much you exert yourself – as well. On the other hand, many of them also have elements of consistency such as duration while gradually scaling up how many times an exercise is done, known as reps, with the end result being that your body becomes conditioned in the way of endurance or strength. Whether or not you see the terms themselves bandied about in a workout description, aerobic and anaerobic training both figure into the most well-balanced regimens. Aerobic exercise simply refers to activities that require oxygen, which is needed to burn carbohydrates and fat to produce energy for continued exertion. During aerobic exercise, which typically includes low- to medium-intensity activities, your heart rate remains elevated for as long as you are engaging in the activity. While running, cycling and jogging are perhaps the most well-known forms of aerobic exercise, any activity that boosts your endurance and maintains a relatively steady intensity for a sufficient amount of time could fall into this category. Swimming, tennis, volleyball and even walking up several hundred steps can all constitute aerobic exercise as long as the activity is consistent and sustained. Among the many health benefits aerobic exercise – also known as cardio – confers are increased endurance, a stronger heart muscle that is more efficient at moving vital oxygen throughout the body, and even improved cognition in young adults, according to a 2009 Swedish study. Anaerobic exercise, as its name suggests, requires sources other than oxygen to produce energy. The two main sources for anaerobic activities, which tend to have a shorter duration than cardio but higher intensity, are anaerobic glycolysis, a process in which the body breaks down glucose and produces lactic acid instead of using oxygen, and high-energy phosphates that are stored in small quantities in your muscle cells. The most well-known anaerobic activity is resistance training with either weights or one’s own body weight. This activity engages fast-twitch muscle fibers for short bursts of intense exercise followed by a brief resting period; repetition and gradually ramping up the intensity over a period of days or weeks both lead to increased muscle mass. Anaerobic activities, which can include high-intensity interval training, gymnastics, sprinting, swim sprints, some martial arts and even normally aerobic sports like volleyball or tennis when played with enough intensity, yield increased muscle mass and decreased body fat, and they can also boost your metabolism – even when you’re resting – and bolster your maximal aerobic capacity, known as VO2 max. Numerous experts agree that the best workouts include both aerobic and anaerobic activities since the benefits of each are different and complement each other well. Some regimens blend them together; circuit training, for example, alternates between intervals of anaerobic training and short bursts of cardio to keep one’s heart rate up through the entire workout. Other trainers swear by beginning or ending with 30 or more minutes of cardio along with a period of time dedicated entirely to various weight-based exercises. Obtaining a consistent balance of both seems to be the overarching principle, so you’re free to experiment to find which regimen works best for you as long as both types of activities factor in. This is an article by Andrea Wilkins. She is a freelance writer and expert in health, fitness, and travel. When she’s not writing she can usually be found reading a good book or hitting the gym.